I love soup. Warming, nourishing, easy to make and very useful for using up bits and bobs in your fridge, it’s a very useful addition to any cook’s repetoire. Some soups are just a delicious dinner and rarely thought of again, but some are classics that end up defining a nation and becoming famous outside their home. Vichyoisse, gazpacho, tom yum, minestrone, we all know and love them. But one that deserves to be on that roll call is the Portuguese staple caldo verde or ‘green broth’. 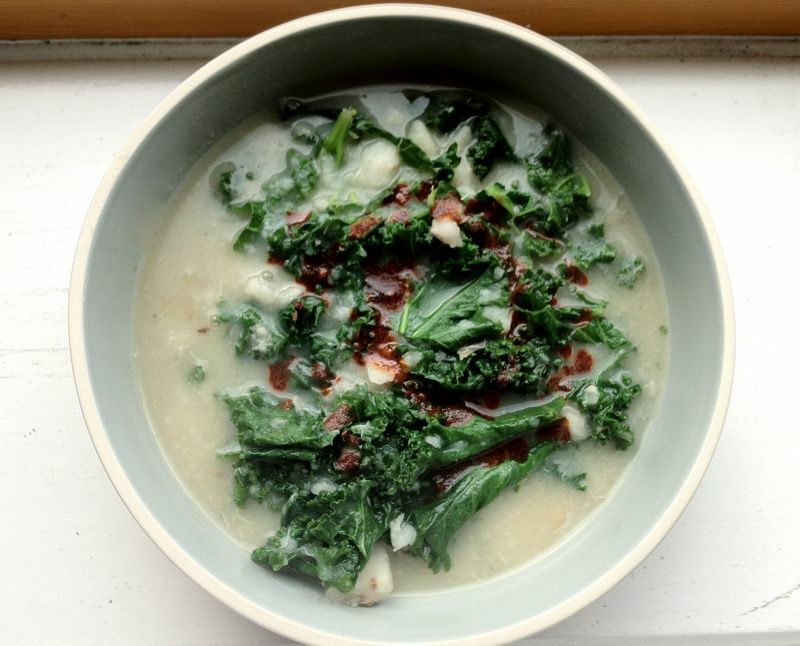 Usually made at its simplest with potatoes, kale and water, this soup is thick with spuds and given texture with shredded greens that restore and revive in its simplicity. These days it is often enhanced with the paprika-richness of chorizo and the depth of chicken stock, but it’s still an example of how basic ingredients can be combined to make something special. So I decided to play around with it and combine Lambeth’s Portuguese and Caribbean heritage by substituting eddoes for the potatoes. 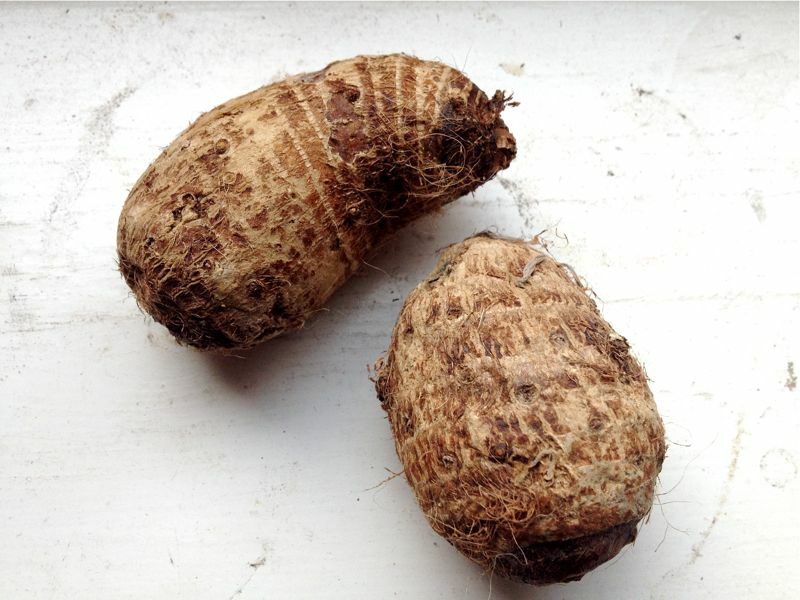 Small slightly knobbly tropical vegetables, eddoes look like a shaggy spud and are similarly versatile to cook with. Pick ones that are nice and firm all over and peel well, until the vegetable underneath is clean and blemish free. Work quickly doing this as eddoes have a slightly gluey feel and discolour quickly. Then use them as you would a potato, but bearing in mind their firm texture makes them more robust and able to take strong flavourings. Chop your onion and garlic into a fine dice and sweat in the olive oil, leaving two teaspoons worth aside. Peel and chop your eddoes into eighths as you want the pieces small enough to fall apart or mash to thicken the soup. Lightly coat the eddoes in the oilve oil and soft translucent onions and then cover with the chicken stock. Bring to a heat where the stock bubbles gently but doesn’t boil and then cook for 10-15 minutes or until the eddoes are soft and falling apart. Give the eddoes a helping hand if they still seem quite solidly shaped and mash them to coarse crush with a potato masher. The soup should be thick and have texture, not be smooth. Add in the shredded kale (I buy mine at the Farmers’ Market on Sundays) and cook for 3 minutes. Season to taste with salt and lots of black pepper and the nutmeg. Take the the olive oil you reserved and mix with the smoked paprika. Slice the sausage into half moons if you’re using it (I am currently obsessed by the vast array of Polish sausages in the Crackerjack Food & Wine on Brixton Road in the block in front of the Academy.) Place them in the bowls and top with the spinach leaves. Pour the soup over this and then drizzle with the paprika olive oil and enjoy! Fresh, tasty and quick, I love this soup just as it is. It makes a great family dish for veggies and meat eaters alike and is on the table in no time. The eddoes work even better than potatoes which can get a bit waterlogged if you cook them for too long. This was thicker and heartier and really worked with the paprika. My favourite soup just got even better! Miss South is also Food and Drink Editor at Brixton Blog and their little brother paper the Brixton Bugle. This post originally appeared there. Portuguese Tapas...or how I learned to love liver. I was just wondering why I am getting all these outdaed updated to your blog now? I would have joined in the past 6 months but now I am getting lots of updates from November 2012. No harm done, just I can’t get the ingredients now! Can you check what’s happening and let me know- of course I love your blog, so no panic. Hi Helen, sorry about that. Had some stuff lined up ages ago and it didn’t publish (I did the scheduling wrong!) and then had to do it manually, so you got a bit bombarded. So sorry. Normal once a week schedule resumed!